Description: This operator provides a handle to the simulation environment. The simulation environment offers several fields than can be used to access its global properties. Description: Applying a force <vec> to an existing mass <mass>. This operator is useful to implement user defined force fields. It should be called in the Integration Tick slot. Description: Setting the force <vec> for an existing mass <mass>. This operator is very useful to implement user defined force fields. It should be called in the Integration Tick slot. Description: The operator force is closely related to physics simulations in CindyLab. It can be used for testing the force that would affect a mass particle at a specific position. The vector <vector> represents the position. The operator returns a two-dimensional vector that is the force at this position. If no modifiers are used, the operator assumes that the probe particle has mass=1, charge=1 and radius=1 (see Free Mass). Example: The following picture was generated using the drawforces operator and a color plot of the force operator. 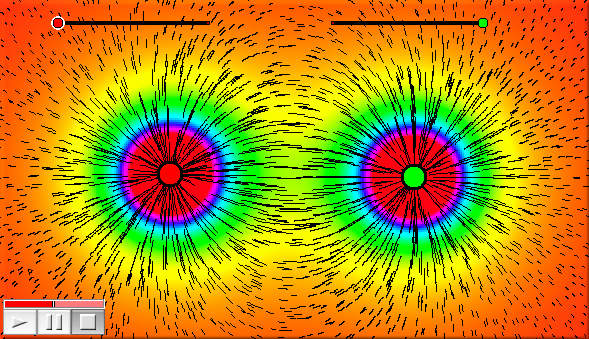 It shows the force field and force strength of the electrostatic field of two charges. Modifiers: It is also possible to set the values of mass, charge and radius explicitly. Each of these values can be set by a modifier of the same name. If at least one of these values is set explicitly, then all unset values are set to zero. Thus force([0,0],charge->2) tests the force that would be present for a particle of charge=2, mass=0, and radius=0 at point [0,0]. Contributors to this page: Wurster , Richter and Kortenkamp . Page last modified on Thursday 10 of July, 2014 [08:18:13 UTC] by Wurster.